Despite a sporadic trail, the ground for once held firm and flat. I took in what was surrounding me, and what my eyes settled on will stay with me for the rest of my life. I’ve hiked through the Sierra Nevada, the Cascades, the Pyrenees, the Appalachian Mountains and more, but never had I been so in awe of the wilds that surrounded me as that afternoon in Scotland. As I progressed, the lower flanks of Seana Bhraigh cleared, revealing the wide gaping valley of Gleann a’ Chadha Dheirg. Teasingly, the spectacle unfolded. With each step came a slight change, my angle of view refined, and those lower flanks moved aside just a little more. After all the tweaks, the full majesty of Gleann a’ Chadha Dheirg presented itself. At times, it appeared menacing. Seana Bhraigh, on one side of this valley, rose and stood proud of everything it surveyed. On the other side, of shorter stature but of no less beauty, stood Meall Glac an Ruighe. Both stood guard like sentinels, one minute placid, the next imposing like the gates of hell itself. Steep sides plummeted from a lofty perch, tumbling down from grey to green lowlands, and a ribbon of shimmering water wound down to meet me. The valley walls ran away, stretching further and converging until they curved and carved in to meet each other some 2,200ft up, and two miles distant. As if that weren’t enough, Seana Bhraigh and Meall Glac an Ruighe tore into the sky, attempting to upstage Gleann a’ Chadha Dheirg itself. It appeared the sky wanted in on the action too. The clouds had merged into one huge mass which sported virtually every possible variation of black, white and grey. It rippled and undulated as though alive, breathing, and then, as if I couldn’t take any more, the sun appeared again. Through the tiniest break in this veil high above, chinks of light streamed through, flashes raced down to meet me as I appreciated their warmth. The Highlands came alive, light and shadow danced over the lowlands and tore up the mountains. Dark then light, in shadow then illumination, it was the ultimate cinematic experience, and I was the only one there to bear witness. I sat there, open-mouthed for an hour. No-one shared my corner, nobody experienced what I had seen. 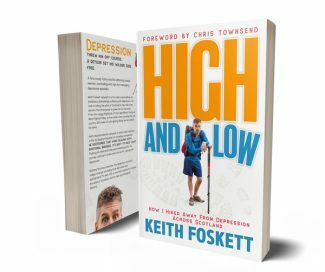 You can buy High and Low in either Ebook or paperback exclusively on Amazon.